Type I & II as well as most state and federal specifications. For use on bituminous, Portland-cement and concrete pavements, as well as various sealcoat applications. May be applied with conventional or airless sprayers. 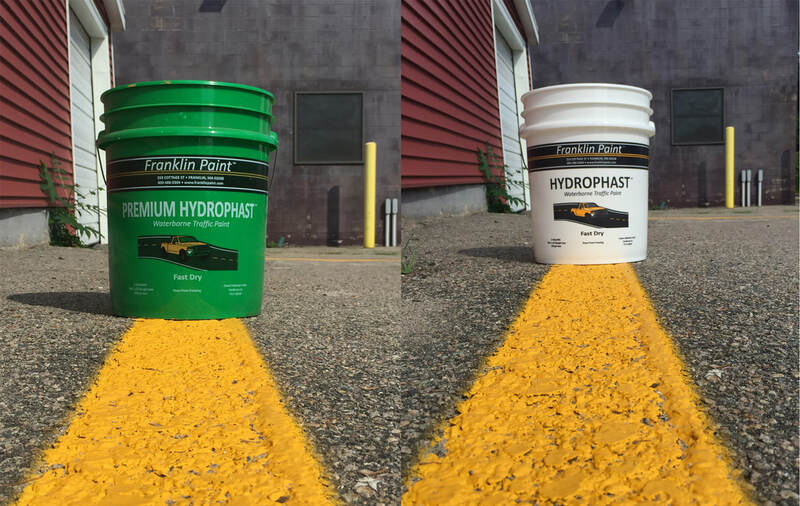 A durable fast drying alkyd traffic paint modified with chlorinated rubber. Conforms to current federal VOC (Volatile Organic Compounds) regulations as well as NH cold weather specifications. For use on bituminous, Portland-Cement and concrete pavements. Not recommended for use over concrete sealers containing silicone or asphalt sealers. A durable fast drying acrylic/alkyd traffic paint. No pickup in as fast as 3 minutes. Conforms to current federal VOC regulations as well as newer lower state VOC limits of 100 g/L. For use on bituminous, Portland-cement and concrete pavements. Not recommended for use over concrete sealers containing silicone or asphalt sealers. May be applied with conventional or airless sprayers.